While there has been a proliferation of cctv systems setup in Sydney to protect both residential and commercial properties, this doesn’t mean that all properties are perfectly protected from criminals. Security cameras are excellent deterrents for intruders and can be used to provide evidence when a crime does occur, but it is possible for a security system to be compromised, whether by being hacked into or physically damaged. Hacking into a security system requires a level of skill and technological capability that is beyond most potential intruders, so it is usually not a danger that needs to be considered by the average owner of a security system. However, if a security system is not installed thoughtfully and properly, then physical damage to a system is a real risk for compromising the security system. On the other hand, a knowledgeable professional can ensure that the correct steps are taken to minimise the risk of tampering. One of the first and most obvious steps to prevent tampering is correctly choosing where to place security cameras and their cables. Simply placing cameras on high walls or ceilings can act as a deterrent. Placing the camera flush to the wall or ceiling to minimise its’ exposure to intruders can help too. The casing placed over the camera is also an important factor. Plastic casings can be easily cracked and destroyed, but a strong metal casing makes it difficult to damage. Having a rounded dome casing also can prevent intruders from hanging clothing or other material over it to block its’ view. Finally, you can prevent cables from being visible to tamper with by running cables directly through the walls or ceilings behind a camera. Lastly, there are ways to detect if a camera has been tampered with. A camera that has been tampered with can send a signal back to a monitoring centre, alerting that someone has attempted to access it improperly. Tamperproof systems allow for a trip wire that runs on a separate circuit, so that if someone cuts the power for the main circuit then the alarm will still sound. Even in the event of a power failure, backup batteries ensure that tamperproof alarms will continue to work. An alarm system that isn’t installed properly is vulnerable to being tampered with. 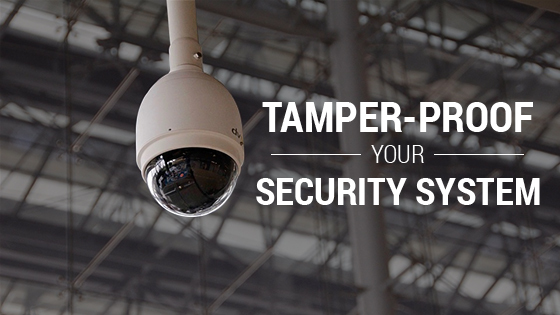 For tamper-proof security solutions, give Red Handed Security a call on 1300 13 40 33.